The bell jingled, and Emmeline looked, frowning, at the door through to the front of the shop. She was in the middle of a fitting, and one did not expect interruptions if one was being fitted for charmwear at Emmeline’s. When a moment passed and Joe, her apprentice, did not appear around the corner, she smiled at Mme Gantiel. At least it was cheerful Mme Gantiel, rather than one of her fussier or more class-conscious clients. She’d never minded any of them, in the years since she’d taken over from Papa, but recently, she’d become more and more irritated by their self-absorption in their own tiny part of this one small city. There was more to the world that that. She sighed, transferred the pins in her hand to the pincushion at her waist, and went through to the shop front. Charmwear was never ready-to-wear, so Emmeline had no stock on display, and she did not need to advertise to fill her client list. Thus the shop front was tiny, holding only her desk and appointments book, and just now it was almost all taken up by the guard captain who stood there. Outside stood a similarly large lieutenant. Well, that explained Joe’s absence. He nodded amicably, and made no move to wait in the street. Emmeline got through the remainder of Mme Gantiel’s fitting in record time. She was proud to notice that her hands weren’t even shaking. The inspection was anticlimactic. She didn’t glance towards the hidden box, and they didn’t find it. But they did rifle through every cupboard and drawer in her fitting room and workroom. “What do you do with leftovers, miss? After you’ve cut a dress or whatever out?” Captain Berrith demanded abruptly. Her stomach lurched, but she answered calmly, pasting on a slightly puzzled look. As she was obliged to do; and the dustman was obliged to burn it. Couldn’t let the plebia get their hands on charmcloth, not for their own use. “Well now, miss,” the lieutenant began chattily, then shut up at a glance from Captain Berrith. “These labels here are accurate?” Captain Berrith asked, running his finger along the shelf edges. Warmth, Beauty, Plausibility, Charm — the charms of her trade. Hardly ones to interest the Guard. “Of course.” And get your hands off them. Five minutes after they finally left, Joe reappeared via the back door. “We had visitors while you were gone,” she said. “Did we?” he said, not meeting her eyes. She’d known for a while that Joe’s spare time was spent in what he might call politicking, and the guard would definitely have called rebellion. She’d not mentioned it. They both had their secrets. “Do they suspect the Masquerade?” she asked. She hoped, desperately, that it had just been dropped, and no one with it at all. The Masquerade. The most popular rumour about the name was that they wore masks. Which would be foolish; masks drew attention, and the Masquerade preferred secrecy. More likely was that the name was a muddy reflection of the Guisers, the traders from over the mountain who brought charmcloth; the charmcloth that, in barely a decade, had turned a city of many porous layers into a city of two halves divided by an uncrossable chasm. The Masquerade’s slogan was ‘true equality’. Emmeline wasn’t even sure what that would look like any more. “Mm,” she said, staring out of the window at another guard patrol. There were more and more guards, now. She’d wondered if someone would notice the scraps, sooner or later, despite her efforts to hide them. She hadn’t thought about what would happen. The sensible thing would be to stop. The sensible thing would be to do as she always had before: keep her head down and be grateful for what she had. It had begun with Memory, only a couple of moons ago. She didn’t handle Memory often. Memory was for small things and keepsakes, a different kind of craft from hers. But Mme Ydrit, newly widowed, wanted a nightgown of Memory, to remember Mr Ydrit as she slept. As Emmeline sat and cut and sewed, she looked at the piled scraps of shimmering silver Memory, and her fingers slowed, until she put Mme Ydrit’s nightgown aside. She picked up the scraps of Memory, and laid them out on her worktable. She thought of her grandfather, stitching little pieces of cloth together; of a quilt on her childhood bed made with little pieces of Granny’s skirt, Grandfather’s apron, her aunt’s baby blanket. She remembered her father sitting by her bed in the dim evening light, telling over the list of the pieces in a soothing drowsy drone. They’d lived down by the docks then, and Grandfather made workwear and in tough times mended sails. Emmeline used to gaze at the ships coming up and down the river, dreaming of boarding them and going to faraway lands. Grandfather had taught her to sew, and later, Papa had taught her to tailor. By then they’d moved away from the docks. Papa’s burgeoning tailoring business was doing well, and the well-to-do didn’t want the smell of the docks in their nostrils when they stood to be measured. Emmeline still thought of the ships, and once she finished her apprenticeship, she had started putting coin aside to go away for her journeyman time. There were other cities, down the river or across the plains; other things to learn. Then Grandfather had died, and it didn’t seem like the right time to leave Papa on his own. It had been a year, maybe two, after that, when charmcloth had arrived, with the Guisers who had never come over the mountains before. It was expensive stuff, but oh, so much in demand, right from the start. Emmeline had just finished her journeyman time, and it seemed like a golden opportunity to specialise in something that the rich would pay through the nose for twice, first for the cloth and then for the tailoring. She’d had to use up her travelling money for the initial investment, but she’d known it would pay off, in the long run. Then Papa in his turn had died, and suddenly she was the proprietor of a shop, with a solid reputation with this new material. She still wanted to travel, but she’d had to take an apprentice, Joe, to cover the workload; and then she felt a responsibility to see his training through. He would be done this time next year, though. By then she’d have enough saved to travel, to keep herself for a while, and then to set up somewhere else. Somewhere new. One more year. It could be worse. It was the year of Papa’s death that what had been purely a matter of money became a matter of law: charmcloth (in its limited quantities, one delivery per season) was only for the patria. The patria had barely existed as a separate group before then; an old name, dating back to an older, more divided society that the modern city felt it had (ha!) left behind. Certainly, some had more money than others, but money you could acquire, if you were lucky and worked hard. But once only the patria could use charmcloth, suddenly the city consisted of two halves: those with the charms, and those without. Folk from all parts of society still traded; but how could a trader without Luck compete with one who had it? Who could measure their honesty — or lack of it — against someone wearing an undershirt of Plausibility? Anyone could attend a dance, but lacking Beauty or Charm, your wooing would proceed less smoothly. Even in the army, where, notionally, officers were provided with Death and Destruction regardless of their backgrounds, why, having access to Strength or Authority beforehand eased your way to that gold braid on your shoulder. Those with charmcloth found their expectations changing in ways such that those without it came up short, every time, in every way. And those with charmcloth were, more and more, the ones making those decisions. Folk who couldn’t buy it tried to work out how it was made, but without success, and those who tried to follow the Guisers on the way home came back with broken bones, or not at all. Her grandfather wouldn’t have trusted charmcloth, and Emmeline thought, now, that he would have had the right of it. She could still see his fingers clearly, holding scissors or chalk or pins; but the memory of his face was fading. He’d done a little tailoring, her grandfather, but it was that patchwork quilt that she remembered best of his sewing. She looked down at the pieces of Memory on the table, then, slowly, began to move them around, trying them against one another, comparing the result with her memory of that quilt. She shouldn’t use these scraps, of course. She should throw them out with the rest. But, perhaps, just this once… A keepsake, just a private one, for her grandfather’s memory. Her first attempt was sadly ragged, the lines of the charm running this way and that way, wriggling against one another. She sighed, and pulled the stitches out, and tried again. This time, she matched the scraps carefully, trimming edges, fitting the subtle lines of the charm back together. 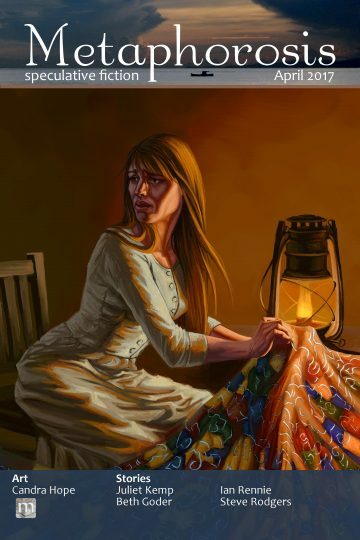 Her eyes prickled and her back ached as she sat into the night, sewing under the flicker of the gaslamp. It was past midnight by the time she was done. It looked right, the lines flowing smoothly; but with Memory you needed something to trigger it. She held the tiny bag open in her palm, took her grandfather’s thimble out of her sewing box, and dropped it in. The memories sprang to life inside her mind, reeling across it like pictures on a string, bright and new. After a few minutes, Emmeline put the bag carefully down, wiping tears from her cheeks. She tucked it inside a drawer. Tomorrow she’d make an outside, and a lining, to sandwich it between. It wouldn’t do for the city’s premier charm tailor to be caught with illegal cloth. Her glance fell on the piles of trimmings from her attempts, and she shook her head slightly. Wasteful. Next time… Then she shook her head more sharply. There must not be a next time. She couldn’t be caught using charmcloth for herself. Prison, public whipping, loss of livelihood…A fine. Her leaving money gone. No. Once was more than enough. She’d sewn that little bag of Memory in the middle of the autumn. In the next weeks it grew colder, and the nights grew shorter. It didn’t affect Emmeline, who would well afford firewood and a thick quilt. Not all her neighbours were as fortunate. Emmeline, picking out unbruised apples at the greengrocer, looked up. The speaker was Gareth, a young builder who lived around the corner. Had it been that way when she was younger? Not as much, Emmeline was sure. There were more folk struggling, now; while the patria grew ever richer and more comfortable. Home again with her apples, Emmeline turned over the scraps of Warmth that she’d just cut from the bolt in making Major Arad’s new winter cloak. She didn’t usually do menswear, but Major Arad was insistent that her cloaks were better than his regular tailor’s. This year’s cut was wildly fashionable; open across the front, it barely reached the wearer’s hips. Made in wool it would leave the wearer freezing; in charmcloth, it didn’t matter. Not enough merely to have the advantage; to be fashionable, one had to flaunt it. And what, she wondered savagely, would happen to the Major’s old cloak, the one she had made for him only last year? Doubtless it would go in the disposal. The Granny Zetas of the city couldn’t be permitted charmcloth of Warmth, even if it was last season’s style. Unbidden, her fingers were arranging the scraps alongside one another, turning them to fit together. She paused, suddenly unsure, then the wind whistled through the crack in the window and her chin went up. She pulled her bag of Memory out, seeking a clearer recollection of the patchwork caps Grandfather used to make from flannel. This, he would have approved of. She sandwiched the Warmth, patched carefully together, between two layers of plain flannel, and took the cap to Granny Zeta the next morning. Emmeline sat for some time that evening, looking at the basket of scraps and thinking of Granny Zeta. There were too many Granny Zetas. But she could hardly help them all. Sooner or later, she’d be caught. But then — what if no one knew where they came from? There were plenty of charitable organisations, these days. An anonymous gift, a series of anonymous gifts, to a different organisation each time… Surely that way there could be no trouble. Slowly, she reached for her pile of scraps, and began to pick out more pieces of Warmth. And then after that, maybe some Happiness. People could use that, this time of year. It felt a damn sight more useful than sewing pretty this-and-that for overbred ladies. The pretty this-and-that was putting pennies and pounds into her savings. This — this would keep her busy, until she could leave. Less than a year, now. She couldn’t predict when she’d have scraps left over that she could use, and she couldn’t allow them to be taken away every week; so as she tidied up every evening, a handful of pieces went into an old hatbox, hidden under a floorboard she’d prised up. When she had time, she sewed them up, as linings hidden within normal fabric, and dropped them off to one charity or another. She told herself that it wouldn’t go further; but she knew at the back of her mind that she wasn’t telling the truth. The guards’ visit, only another few weeks after that first cap for Granny Zeta, was only the final stitch in a decision already made. Working on her own she could do a little. Working with the Masquerade she could do more. The trouble was, the charms the Masquerade wanted most were the ones that Emmeline found hardest to come by. Stealth, Patience, Secrecy, and their cousins. Not the stuff of high fashion that she most commonly dealt with, although the similarly-useful Concealment and Deception were both more popular in her work than one might think. She became ever more skilled at using the tiniest of pieces, sewing the scantest of seams. Every time she mastered a slightly more frugal technique, she went back through the scraps bag again, sorting out the tiniest of pieces from previous constructions. Each night another scarf or handkerchief or cap, its outer layers of patchworked flannel and cotton and linen concealing its inner secrets. She didn’t give anything directly to Joe; she put each finished item in that hidden box, and she was careful not to see when he took it. After that first conversation the day the guards had visited, neither she nor Joe referred to the matter with word or gesture. She yawned more, in the daytimes; but it was worth it. A while passed, and one day Joe was sweeping out the workroom, with heavy sighs and sideways glances at her. Emmeline sighed. “What is it, Joe?” Time off, doubtless. Her eyebrows flew up. “Of course.” She glanced around, then beckoned him into the fitting room, which had no windows, and shut the door. He mimed, briefly, a pistol, aimed at the floor, and Emmeline blinked. Destruction. Death. Charms she’d never worked with, charms that the armorers near the river, closer to the city limits, used. “They could — someone could get the makings for you,” Joe said, still to his hands. She swallowed. “It’s not that.” Her decision solidified as she spoke. “It’s not — I won’t. Not those.” Not killing. She shook her head, still thinking. She knew, of course, that the Masquerade weren’t a bloodless group. She read the papers. After that, she started finding bags of extra scraps in the box. They didn’t speak of it again, even when the news started talking of illegal charmwear and charmwork; even when the guards announced that charmworkers would have to hand their scraps and leftovers over to be destroyed; even when those bags of scraps began to be weighed against what had come into the shop. Emmeline sewed smaller and smaller. She found ways of secreting the tiniest of pieces away — there was always an error margin in the weighing — and the bags of extras kept appearing in the box, though they were smaller bags and smaller pieces now. She changed, just a little, the design and style of the clothes she made; she used more thread-heavy stitching, more cutaways, more decorative furbelows that deceived the scales by compensating for the bits she cut out or the seams she sewed a touch more scantly. It was as well that the guards doing the weighing didn’t understand tailoring. And all the while she kept counting her savings. Soon. She’d be able to leave, soon; leave this wretched place behind. The guard captain, standing in the front of Emmeline’s shop, looked like a man with beautiful visions of promotion dancing in front of his eyes. Joe, held firmly by a private nearly twice his size, one eye puffing up and blackening, looked sick and scared and trying for defiant. She gestured at the dismembered handkerchief lying on the table. “Well, miss, unless you’re about to confess yourself, ha, I’m afraid I have to disagree with you,” the captain said briskly. Emmeline stared at him, envisaging herself confessing, being taken away in Joe’s place, Joe set free.. Except of course Joe wouldn’t be set free. The visions wound onwards. Both of them in chains, under question… She swallowed sickly. “You do that, miss,” the guard captain said equably. “I’m sure this can all be straightened out!” Emmeline called after them, willing her voice not to shake. She waited a nervous half hour before she tied her cap on, hung a shopping bag on her arm, and set off. She’d made a scarf of Discovery last night, and Joe hadn’t had a chance to take it this morning. That should help her find the place she needed. She could have used Concealment, too, but there was nothing to be done about that; she had no time to piece together the tiny handful of scraps hidden in the press. But a woman of her age, drably dressed and carrying a shopping bag; she looked like she belonged here. That would be concealment enough. She walked like she knew where she was going and like it wasn’t important at all, and she eyed the guards in the street with the right amount of caution. Wary, because who wasn’t wary, down here, of the guard? But with no reason to hide from them. She knew roughly where Joe spent his spare time. She was banking on finding the centre of the revolution close by. She was banking on there being a centre, and someone of authority she could talk to. When she reached the Bull and Cat, she tied the scarf more firmly around her neck, and fixed in her mind what she wanted to find. She concentrated on the feel of the scarf at her neck, and on where her instinct was telling her to go next. Although — if Discovery alone would do the trick, wouldn’t the guards have found the people she was looking for long before now? Well. It was this or nothing. Hand rubbing the corner of the scarf, she turned right from the corner of the pub, then left down an alley, cleaner than you might have expected round here. Left again at the end, then right into a courtyard, past what might be a heap of refuse and might be trying to become compost for the window-boxes growing green leafy vegetables, and up a wooden staircase to the second floor of the middle house. The staircase didn’t creak underfoot; it didn’t shake. The curtains in the second-floor window were thick enough to block out all but a sliver of light around the edge. The door swung open before she could knock. Her stomach lurched. A girl of about Joe’s age stood just inside, looked her up and down, then stepped back to let her in. “Thanks, Hira. You’d best be off.” The voice came from the far corner of the room, where a woman sat in a threadbare red armchair, her grey hair scraped back behind her ears. She was smoking tobacco wrapped in a twist of black paper, and from the ash scattered around her feet, she’d been there for a while. Emmeline had vaguely expected piles of papers or stacks of weapons, but there was nothing but the woman in the chair, a table with a pot of tea, and a fireplace. A long strip of parchment hung on the wall beside the table, with writing in the script of the city beyond the plains. A souvenir of this woman’s travels? Emmeline felt a sharp stab of envy. “So you’re just going to leave him?” Emmeline’s stomach churned. “And he might not.” They’d been cracking down harder, or late. She held Emmeline’s gaze for a moment, then looked away, drawing her attention inwards; an obvious dismissal. Emmeline stood for a moment, helpless and frustrated, then clenched her hands and turned to go. There was no help here. “I’m glad you came, though,” Sally said, as Emmeline reached the door. If only that had done Joe any good. “Just not if I were arrested,” Emmeline said. It was too hard to swallow. By the time she got back to the workshop, she had half of a plan in mind; and no time to do anything but hope that the rest appeared as she went along. She worked quickly, cannibalising the row of hangers with completed or half-completed customer orders. She pulled down the gossamer-thin petticoat of Plausibility, designed to fit under Mlle Yara’s Solstice ball gown. Emmeline had never managed to work Plausibility into a patch; it tore and frayed easily enough that sewing it straight from the bolt was a challenge. The petticoat would have been long on petite Mlle Yara; on Emmeline it came only to mid-calf, and a couple of rolls of the waistband brought it up enough to hide it under her outer skirt. She held it together with a chain of safety-pins, and kept rifling through the wardrobe. Major Arad’s undershirt of Luck, awaiting its buttons; the only piece of Luck that had come her way in the last couple of years. People were superstitious about Luck; they preferred heirloom garments and keepsakes. It wasn’t done to rely on it too much, either. Emmeline had carefully tucked away the few fragments of scraps that she’d come by, but there was no time to do anything with them now. She pulled the big undershirt on and shrugged her blouse back on over it, frowning at the way the undershirt bagged out the blouse. But she would be wearing a coat over it, and she found it hard to believe that the guards at the prison would have an eye for fashion. It would pass. She tucked a couple of things into her bag, then found herself packing up the roll of her best dressmaker’s tools, the ones that she would save if the shop were on fire. She paused, wondering what she was doing. The undershirt shifted against her skin, and she breathed in, slowly, and let her hands do what they would. It would be foolish to carry the purse of her leaving funds through the streets; but she found herself hanging it under her skirts. At the last moment, she thrust the tiny Memory bag, the one that had started it all, into her skirt pocket, then let herself out of the house. Jimmy the Cart wasn’t at his workshop in the next street. She could hear voices raised around the corner. She bit her lip for a moment, then ducked in. When she came out again, an observer, if they looked carefully, might have noticed her moving just a very little stiffly. The prison was a ten minute walk. She knew the streets were heavily patrolled here, but as she walked, they seemed oddly deserted. She let her feet navigate automatically through twists and turns that her conscious mind wouldn’t have taken, pausing for a moment then moving again, feeling the shift of the undershirt as she went. There was one, young, harried-looking lieutenant on duty at the prison, who peered at her from behind the barred door. “Go away, miss,” he said before she could say anything. There was obvious anguish in the young lieutenant’s face. Everyone knew Lady Wirral. She had opinions about prisons. Emmeline made nice robust walking-clothes for her to go and harass the prison officers in. The lieutenant swallowed – Emmeline wasn’t sure who was the bigger threat — then backed away a bit from the barred aperture. With clankings and clatterings, the door creaked open a bare couple of inches. Emmeline hoped desperately that he wouldn’t ask to inspect the sealed envelope she was brandishing, but her Luck held. Joe was peering through the barred window of his cell, looking out at the city. He spun round when the lieutenant unlocked the cell door, opened his mouth, then shut it again until they’d been left alone. “Emmeline…” he started, sounding anxious. Emmeline was already reaching up under her skirts, uncoiling the length of rope she’d wound round her waist and legs, and the cart-jack she’d strapped onto one leg. There were two matching patches of raw skin, top and bottom, where it had very nearly slipped down. Joe blinked at her, wide-eyed. “I assume you didn’t want to stay here,” Emmeline said. Emmeline could see, suddenly, the shape of Joe’s worry. That, inevitably, the blame would be laid at their door; that the consequences would follow them, would smother the rebellion, exactly the way the group were trying to avoid by abandoning anyone who was caught. But she couldn’t leave Joe here. She went to the window, fitted the cart-jack in between the two bars, and began winding, grunting a little with the effort as it began to bite into the bars. After a moment, Joe stepped up and took over. Emmeline shook out her skirts, then squeezed in beside Joe to tie the rope onto another bar. It took surprisingly little time before there was enough of a gap for skinny Joe to slide through. Emmeline leant out to watch him shinning quickly down the rope. When he was nearly at the bottom, she took a deep breath, squared her shoulders, and marched out of the cell. At the lieutenant’s little room, she insisted that he make a record of her visit, with her name and address nice and clear, and whom she had visited. All the while he was writing, her neck prickled with anticipation of a shout, someone realising Joe had gone. The undershirt, despite its softness, prickled against her skin. She marched out of the door once he was done, head held high; then took to her heels and ran. She fetched up at one of the outer bridges over the river, most of the way to the city limits. It was late; the houses along the riverside were quiet. The water flowed under the bridge, ripples gilded with moonlight. Flowing out of the city, away past the foot of the mountains and onward to the distant sea that she’d seen only on maps. Her eyes rose upwards to the mountains themselves and to the pass the Guisers came over. How did they make the stuff? The world was so much bigger than this one small city. She couldn’t go back to the shop, now. She might have protected the Masquerade — she certainly hoped so — but that was the cost of it. What now? She felt the weight of the purse holding her leaving fund, hanging from her belt. She’d been intending to stay until Joe was through his apprenticeship; but that tie was gone too. She could just leave, finally, like she’d planned. She should have given Joe the key to the shop. There was a lot of charmcloth there, kept safe under lock and key. Someone could use that. She thought of Granny Zeta, of all the Granny Zetas. She thought of the Masquerade, and whom they sacrificed for what. In her head, she heard Sally — you know where we are — and across the other side of her belt from her purse, she felt the weight of her dressmaker’s roll. Her tools. She’d been doing good work, here. She’d been helping. Her hand stole into her pocket, to the little bag that had started everything, feeling the hard lump of the old thimble inside it. But this time the memories of her grandfather that sprang to life weren’t of him at home with her. They were of him working in the doorway of the shop and greeting everyone who passed; of how often he invited someone who was struggling to share their dinner; of the hundred little generosities which meant people like Granny Zeta remembering him with such warmth. She looked, for another longing moment, up at the mountains. Somewhere new. Somewhere with no responsibility save for herself. Somewhere she’d always know that she’d turned her back and walked away. She took a deep breath, and turned, and walked back into the city. Amazing. Powerful and personal at the same time. The best kind of fantasy. Wonderful story! Magical cloth and secret societies and memories, interspersed with deep issues and tough decisions. I enjoyed so much the descriptions of how she made the clothes.